There was once a time that I was a tour guide aboard the USS Blueback – a US submarine docked in downtown Portland. I confess: I am a submarine junkie. There aren’t many of us. I made a video of the Blueback in my early days of movie making. It’s here. With that in mind, you can imagine my fascination in discovering Ictineo I, the first real submarine, at the Barcelona Maritime Museum. The find was on the Internet a few weeks ago, but today we hopped a train (it’s so easy from here!) and ran off to Barcelona for the day. The goal was to find the sub. Along the way, we found Barcelona again (this was our fifth visit), a fascinating city on the waters of the Mediterranean, sophisticated and lively in so many ways. A recreation of the Ictineo I (launched in 1859, made of olive wood, human powered, used to dive for coral – not a weapon) sits outside the museum where anyone (including me, as you can see above) can touch it and imagine diving under water for the first time in a submersible boat under human control. And here it was in Barcelona, just down the (rail) line from our home in Girona. I couldn’t believe my good fortune. I fondled its wooden hull and peeked inside its portholes (where the face of a mannequin peeked back, scaring he bejesus out of me). Ictineo I made scores of dives before it was ingloriously rammed by a freighter while tied to a dock. What is pictured here is a recreation, but it’s nearly identical to the original, and for a junkie like me, it’s just another reason to visit Barcelona: lovely, lively, exquisite — and just down the road. Ah !! Barcelona !! what a city indeed !! 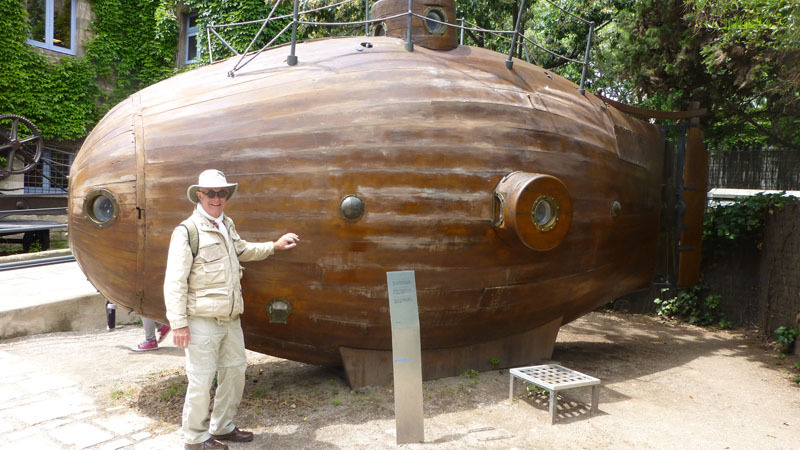 I never knew that the first real submarine, made of wood , was there. Your video of the Portland OMSI submarine was very impressive, Tom. We are discovering more and more about you as time goes on . Please , continue to tell us more personnal stories like that. I love them. I’m glad you are feeling good enough to takie the train to Barcelona. in 1964 by the Gallimard publishing company with an introduction by Michel Déon . a lot about his childhood and the reasons of the foolish image he left of him. I really like to read about his experience among the surrealists and the surrealism. I just found that book (for Kindle) and downloaded a sample. The illustrations should be interesting (on a Kindle — which isn’t very good at that), but it’s the “far from crazy” part that I’m eager to read. The man couldn’t have been too crazy: he became rich from his art, after all.